GCAF 2020 – IF YOU WOULD LIKE US TO SEND YOU AN EXHIBITORS APPLICATION FORM FOR THE 2020 ART FAIR EMAIL US NOW AT glasgowcaf@btinternet.com. Welcome to the Exhibitors Information page of GCAF. Applications are invited from art galleries, print studios, formally constituted art organisations and professional artists. We ask that you read all the information detailed here before completing the Application Form which is attached below. Along with this form we ask that you attach 6 samples of the artists work that you wish to exhibit. We appreciate that due to the deadlines involved these may not be the actual images for sale. Prints on sale must be authographic prints that is ”involving the hand of the artist” in their production. Original print editions of up to 250 are acceptable. Fascia board with gallery name and stand number. Fully erected white shell walls of 2.4m height plus overhead lighting. 30 Free Complimentary Passes to the Saturday and Sunday Public Open Days. Each pass admits two persons. 20 Complimentary Passes to the Friday Preview Evening. Each pass admits two persons. Free entry in the GCAF Floor Plan handout. Website entry that will include the exhibitors full contact details and artist images. Complimentary wrapping service for sold goods. Stewards to assist in helping exhibitors to load and off-load their work. A hanging system for each stand is provided to the exhibitor and must be returned complete after the event. A 4ft x 2 ft table will be provided with each large stand. Power source for laptops etc. Where is the marquee located? 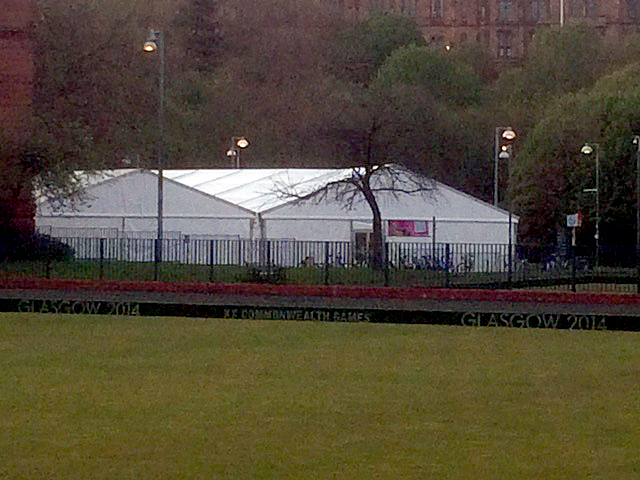 The marquee is located just metres from Kelvingrove Art Gallerys main entrance and car park. Are there toilets? The toilets and disabled facilities are located in Kelvingrove Art Gallery. Is the Marquee floored? The Marquee is fully wooden floored throughout but you will appreciate that as we are building the Marquee on grass the floor is not perfectly flat in all areas. Does the marquee have air-con? As a Marquee by its very nature is not a solid structure installing air-con is a waste of energy as the cold air escapes immediately so unless you are standing directly beside an air-con unit unfortunately there is no benefit. In the event of it being warm the Marquee will be fully ventilated. There will be heating if required. Is there security? There will be night-time security personnel located at the marquee. Is there a storage area? There is a storage located in the Marquee that is free to use and is manned at all times. We ask that you do not leave personnel items in this area. If your stand is located against the marquee walls you may find there is convenient space there to store your works. Is there café facilities? There is very good restaurant and café facilities in Kelvingrove Art Gallery which will be open on Friday (all day but not evening) Saturday (10am-5pm) and Sunday (from 11am – 5pm). Is there car parking? Yes. Please visit our venue section for details. As KAG is a popular attraction the car park can get busy. There is also car parking in the roads close to the venue. We are not allowed by Glasgow Council to section off areas of the car park for exhibitors as it is a public car park. Is there lighting? Yes. Each exhibition stand comes complete with professional lighting on all back and side walls of the stand. The walls of the marquee are ‘window walls’ to enable as much natural light into the structure as possible. Is there music in the Marquee? Due to the location of the Marquee being next to a significant and culturally sensitive venue we are not allowed amplified music within the marquee. We will though have background music playing. Exhibitors are prohibited from piling art on the exhibition stand floor. All work must be unwrapped and hung on the walls.Work can be presented in exhibitors own browsers. Secure storage facilities are available. Exhibitors cannot sublet their space or any part of it to another party without prior permission. Exhibitors cannot display the work or services of another artist/gallery without prior permission. All work on display must be for sale. No distressed point of sale material is allowed. A deposit will be required on notification of acceptance. If the event is cancelled we will return your deposit and stand fee in full but we cannot be held responsible for any additional expenses you may incur. All stand fees must be paid in full by February 1st 2019. If an exhibitor cancels their exhibition stand after this date they will not be entitled to a refund. Exhibitors are responsible for insuring their own work. Public liability only will be covered by GM Events Ltd for the overall running of the fair. Exhibition spaces are non transferable. A few cards and postcards can be displayed and sold but must not dominate the stand. Exhibitors must not play their own music on the stand. About The Organisers The GCAF is owned and organised by GM Events Ltd who have offices in Glasgow and Aberdeen and whose Director Gerry Muldoon and colleagues have been delivering events in Scotland, including the Aberdeen Art Fair, for over 14 years. The company has a first class reputation organising a host of high profile events and have worked in partnerships with many public and private sector organisations including Scottish Enterprise, EventScotland, Aberdeenshire Council, Arts and Business Scotland, Forestry Commission Scotland, Petrofac and TAQA. Advertising campaign on Radio Clyde 2. A targeted newspaper and magazine campaign that includes The Herald, Evening Times, Metro, Herald Magazine, Westender Magazine and Artmag. On-line art magazines and blogs. Promotions with key Glasgow employers, professions, media companies and local authorities. Database marketing to over 25,000 culturally aware prospects in the Glasgow area. An extensive local press ad. campaign. PR and social media campaign led by Prism PR. Marketing and social media partnership with Own Art. Digital campaign with the Herald and Facebook Ads.